Happy New Year's Eve and I hope you enjoy your celebrations tonight, whether you party at First Night or enjoy a relatively quiet night at home. I hope you spend the evening with family and/or friends and drink some type of delicious Sparkling Wine, from Champagne to Crémant d'Alsace, Cava to British bubbly. It is my fervent wish that this New Year is better for all of us than 2018. As I've done for the last several years, I want to offer some alternative suggestions for resolutions, all connected to food and drink. Rather than deal in absolutes, or exact measurements, I merely hope that you choose to do your best to follow these suggested resolutions with the simple goal of doing better than you did last year. I don't expect anyone to follow these resolutions all the time. Please just do your best. I think you might find this easier to do than a more specific resolution which is an either/or proposition. Seek continued forward progress in these ten resolutions. This encompasses so much, from eating less calories to choosing items that have less preservatives and unwanted chemicals. Take small steps in your approach rather than diving into a major change. The smaller steps won't seem as burdensome and it will make it easier to take another small step later on. And even small changes can bring about positive changes. We all would benefit from eating and drinking healthier and it will also help our environment and economy. Local products can help the environment, the local economy and benefit the local community. Plus, many of those local products can be healthier than mass produced, overly processed foods that might come from thousands of miles away. Eating more local seafood is such a great idea, for many reasons, from bettering your health to helping the local fishing industry. This resolution also includes drinking local wines, as every state now produces wine, and you might be surprised by the quality of some of that local wine. Not all local food and drink is delicious or good for the environment, so do some research to find out the best. When you dine out at a restaurant, be polite and show respect to everyone working at the restaurant. Don't demand special treatment or threaten the restaurant just because you write reviews on some community website. Tip properly, showing your server gratitude for all their hard work. If you have a problem at a restaurant, speak to the management and seek if they can resolve your issue. If you enjoy a restaurant, spread the word about your positive experience. Good restaurants can use, and deserve, all the help they can get. It is a very tough industry and consumers need to better understand its difficulties, and be more understanding of restaurant efforts to better pay their employees. Despite the wealth of the U.S., there are still far too many people in our country who can't afford to eat properly. Hunger is a major problem and one that we can do something about. Give food or money to local food banks, national organizations, or any other charity that is trying to combat this problem. Those of us without food security issues can all help out. As 2019 nears, has now arrived, you'll hear plenty of predictions for this New Year, but not from me. We can all hope that 2019 will usher in positive changes to the local food & drink industry. Instead of offering any predictions, I'm going to provide a small list of my desires, those trends, issues and items which I would love to see step forward and take precedence in 2019, though I'm not predicting they will actually come to fruition. However, I think we would all benefit if these desires were fulfilled. Many of these desires are the similar to those I wrote in previous years as those desires did not come to fruition but I still believe they should become more prominent. Maybe 2019 will finally be the year to see at least a couple of my desires come true. Bread pudding is relatively easy to make and can be inexpensive as it can be made with day old bread. Plus, it is a diverse dish that can be made in a wide variety of flavors, with different sauces, and accompaniments. I've had some superb bread puddings at local restaurants, and would like to see more restaurants offering it on their dessert menus. However, I also think there is a great opportunity for an enterprising baker to open a Bread Pudding Bakery. They exist in other parts of the country so why not in the Boston area? Skip opening another damn cupcake bakery, think outside the box, and opt for a bread pudding bakery instead. I've been pushing for this for a few years and it still hasn't caught on. Why not? Earlier this year, I ranted that I was disappointed that we don't have a Georgian restaurant yet in the Boston area. Other U.S. cities have such restaurants and it is time for Boston to do the same. I want Khachapuri, Georgian cheese bread, which comes in over 50 different varieties, with various fillings. I also want Mtsvadi, Georgian barbeque that is made with pork, mutton or veal, often marinated in pomegranate juice and Khinkali, a Georgian dumpling, is often made with mixed pork and beef, though sometimes also with lamb. We need Shkmeruli, a dish of fried chicken in a creamy garlic sauce. I have some hope as I recently spoke to a man at a Georgian business event who indicated he wanted to open a Georgian restaurant in Boston, and I wish him the best of luck. In the Boston area, Sake is largely confined to Asian restaurants and there is no reason why that should be the case. Sake pairs well with all sorts of cuisines, from Italian to French, Barbecue to Burgers. I've previously written about The Science of Sake & Food Pairings, explaining reasons why it pairs so well with varied cuisines. For Sake to become more popular and mainstream, we need more restaurants to carry and promote Sake. Tasting Counter is one of the courageous outliers, a non-Asian restaurant with ten Sakes on their menu. In southern Maine, plenty of non-Asian restaurants now carry the locally made Blue Current Sake. Too much restaurant writing emphasizes the newest restaurants, at the expense of ignoring older, yet still worthy restaurants. As I mentioned earlier this year, there are a number of restaurants that have existed for 15+ years because they have remained consistently excellent, yet few food writers cover them. They need love too, especially in this competitive and tough restaurant industry where good restaurants are forced to close on a regular basis. They need updated reviews, showcasing the reasons for their longevity. We need to ensure these restaurants are not forgotten, and any good food writer can easily find an angle for a story about these worthy places. So many excellent wines get largely ignored by the general public, and even by a significant number of wine lovers. I want to see more people willing to expand their palates and explore these niche wines, from Sherry to Georgian wines, from Crémant d'Alsace to Israeli wines, from Port to Greek wines. Why do you restrict your drinking when you could be sampling all of the world's wine bounty? We need more restaurants adding these niche wines to their lists, and then promoting them to their customers. We need more wine bloggers to write about these wines, persuading their readers to check out these niche wines. You'll find so many interesting and delicious wines if you break out of your usual drinking patterns and try something new. NECAT provides culinary training to students who have had trouble or disadvantages in their past, from ex-convicts to high-school dropouts, from ex-drug addicts to the chronically underemployed. NECAT helps these "students forge a new future, providing them an opportunity for a fulfilling and rewarding career." It is one of my favorite causes and needs much more support and attention so it can continue its great work, helping individuals as well as helping the community. It is another issue which I ranted about this year, and during the past five years, NECAT has graduated 333 students, with 230 currently employed as cooks. I want more food writers to look into NECAT and hopefully write about it, to spread the word about their great work and help them continue to transform lives. What food & drink trends would you like to see in 2019? 1) On Monday, December 31, from 5pm-12am, celebrate New Year’s Eve at Davio’s Lynnfield which, in addition to their regular à la carte dinner menu, will feature a special four-course prix-fixe New Year’s Eve menu created by Executive Chef Andres Tavares. *Regular dinner menu is also available. Reservations are necessary. Please call 781-944-4810. 2) On December 29, starting at 7:30pm, Michael Dutra – a Rhode Island native who has been performing his tribute to Frank Sinatra all over the United States since 2002 – will moonlight as “The Sultan of Swoon” at Tuscan Kitchen in the Seaport District over a three-course dinner featuring the finest artisan Italian cuisine. A perfect Christmas gift for parents and old souls alike as well as a solution to those looking to escape the madness of New Year’s Eve in the city, this early celebration to close out 2018 showcase Dutra’s uncanny talents to channel “Ol’ Blue Eyes” in sound and style making for an unforgettable evening set amongst picturesque floor-to-ceiling windows in Tuscan’s lively bar and lounge area. To reserve tickets, please visit: https://www.eventbrite.com/e/fly-to-the-moon-with-frank-sinatra-tickets-53024240932. Let me finish out the lists of my best recommendations and favorites of 2018. I've already posted my Top Wine lists, Favorite Wine-Related Items, Top Ten Restaurant Dishes, Favorite Restaurants & Food-Related Items and my Top 50 Restaurants. This post will now concentrate on some of my Favorite Spirits, Sake, Cocktails & Drink-Related Items. This is certainly not a complete list but it is more a sampling of compelling and memorable matters I have experienced and posted about over the past year. This is also a purely subjective list, based on my own preferences, and makes no claims about being the "best" of anything. But all of the items here have earned my strong recommendations and I hope you will enjoy them as well. For more spirits, Sake, cocktails and drink-related items, you can just search my blog posts for the past year. Favorite Achievement in Spirits Writing: In The Rise Of Tequila In The 18th & 19th Centuries, I provided some historical background of how some Mezcal in Mexico eventually became known as Tequila. Much of the history deals with the 19th century, and includes quotes from numerous newspapers of that time period. There are plenty of intriguing tidbits about Tequila, from its pricing to how it was viewed in the U.S. And some of this information isn't found in any of the popular books about tequila. Most Unusual Spirits Article: Alcohol is made from a wide variety of plants, from grape vines to grains, and various spices and herbs may be used in its creation as well. However, some people have also added animal parts to their alcohols, such as Mexico's famed Pechuga Mezcal. In my article, Animal Alcohol: Lamb Wine, Pigeon Blood Wine, Spirit of Goat & More, I discuss some of the more unique alcohols that used animals, mostly produced in Asia. I'm not sure how popular those spirits would be in the U.S. but I would be interested in at least sampling them. Favorite Blended Scotch Whisky: Funded by a Kickstarter, the Sia Blended Scotch Whiskey has an intriguing nose, with touches of vanilla, spice, caramel and a tiny waft of smoke. On the palate, it is silky smooth, lacking the burn you find in some other Scotches. You'll find a melange of pleasing flavors, including caramel and vanilla, a strong spicy backbone, and more subtle hints of citrus, smoke, and toffee. It possesses a touch of sweetness and has a lengthy, satisfying finish. It accomplishes its goal of being approachable and accessible. And 1% of sales are donated to charities that help women start and grow their businesses. Favorite U.S. Single Malt Whiskey: Created in Oregon, the Rogue Spirits Oregon Single Malt Whiskey is made from only three ingredients: Rogue Farms Risk™ Malt, Free-Range Coastal Water & Pacman Yeast, and it was aged for about five years in American oak. This light-colored whiskey possesses an alluring aroma, a complex blend of intriguing scents, which will make you simply sit and sniff your glass for a time, enjoying the aroma alone. On the palate, the complexity remains, with a fascinating melange of flavors, caramel to vanilla, baking spice to stone fruit, citrus to chocolate. Silky smooth, well-balanced and with a lengthy & satisfying finish. Absolutely delicious and it will please any whiskey lover. Favorite Gin: Also from the Rogue Ale & Spits in Oregon, the Rogue Spirits Spruce Gin is the type of gin I prefer, presenting a delicious, intriguing and balanced mix of botanicals. The ingredient lists includes Spruce, Juniper Berries, Ginger, Fresh Cucumber, Orris Root, Orange Peel, Lemon Peel, Tangerine, Grains of Paradise, Angelica Root, Coriander & Free Range Coastal Water. On the nose, there is an intense smell of juniper, but beneath the dominant juniper are more subtle notes of the other botanicals, such as the spruce and citrus. On the palate, the botanicals balance out into a delicious and interesting combination, from fresh cucumber to herbal spruce, bright citrus and hints of spice. This could easily be drank on its own, with a little tonic, or make for an excellent component in a cocktail. Favorite Brandy: I love Georgian wine, so it was inevitable that I would expand my samplings to include Georgian Chacha, a pomace brandy. The Askaneli Brothers Premium Chacha is matured in oak barrels for at least 12 months, and is filtered, which accounts for its colorless nature. With a 45% ABV, this chacha has an intriguing floral aroma and was surprising smooth and mild on the palate, with only a minor alcoholic bite. It possessed pleasant and more subtle flavors of hazelnut and citrus with floral accents. It was elegant, with a fairly long finish, and is definitely a very good value at its price. I definitely need to seek out more Chacha. Favorite Spirits Book: John P. McEvoy published the second edition of his fascinating and informative guide to Mezcal, "Holy Smoke! It’s Mezcal!" The first edition was a comprehensive guide that I recommended often, and the second edition is even better. I should disclose as well that I'm mentioned in this new edition for my research into the origins of Pechuga Mezcal. The book is written in a fun and easy style, making it accessible for people of any knowledge level, and you'll enjoy some of the humorous bits scattered through the book. If you want to learn about Mezcal, this book will give you plenty of knowledge, recommendations and more. Favorite Sherry Bar: Taberna de Haro wins this category hands-down, once again, as there is no other local restaurant which comes close. With over 60 Sherries, including some rarer bottlings, Chef/Owner Deborah Hansen has compiled an amazing Sherry list, offering a good number by the glass. The Sherries pair very well with her Spanish cuisine and I could easily sit at the bar all night sampling different Sherries, from a bone dry Fino to a sublime aged Palo Cortado. If you are ever in the area, you must stop here and try some Sherry. Favorite Restaurant Cocktail: While sitting at the bar at La Bodega By Salts in Watertown, I perused their cocktail list and one item leaped out at me, and I knew I needed to try it. The Mangalitsa Old Fashioned is made with Amarena Wild Cherries, Angostura, and Mangalitsa Jamon Infused Bourbon. The Mangalitsa is a Hungarian heritage breed of pig, with a wooly coat, and its flesh is wonderfully delicious. The cocktail was excellent, very savory with a briny element to it, enhanced by hints of vanilla and cherry. Runner-Up Favorite Restaurant Cocktails: Committee, the Greek restaurant in the Seaport, has a very good cocktail program, and two of their cocktails especially impressed me. The first is the Piscoteca, made with Pisco Barsol Verde, house-made tropical fassionola syrup, and lime. It was more dry, with intriguing tropical fruit flavors and a delightful vein of the Pisco. Very refreshing, it would also be a nice summer cocktail. Second is the Holy Smokes , made with Del Magüey Vida mezcal, Lillet Blanc, lemon, cinnamon, and tepache. The smoky agave spirit is prominent, enhanced by the spice and citrus, making it complex, refreshing and delicious. Another excellent choice for a summer cocktail. Favorite Brunch Cocktail: At a killer brunch at Ledger in Salem, I enjoyed their 22 oz Bloody Mary, which is garnished with celery, an olive, a gherkin, and a hot pepper. It was a well made drink, with a pleasant spiciness and some other intriguing spices that were hard to identify, but which helped to make this cocktail different from many other Bloody Marys. And at only $14, it is a very good deal as well. Favorite Beer: I dislike most beer, as I am very sensitive to the bitterness of hops and that taste turns me off. Every once in a while though, I find a beer that appeals to me. This year, I was impressed with the Backacre Beermaker Sour Golden Ale, produced by a brewery in Vermont. My friend Marc Hurwitz, the author of Boston's Hidden Restaurants, brought me a bottle of this beer, thinking that I might enjoy it, and he was certainly correct. This beer is inspired by the Gueuze, a Belgian lambic. With a nice golden color, I was impressed with its complex blend of flavors, with plenty of tartness, bright citrus notes, spice notes, and earthy hints. It certainly reminded me of certain, more natural ciders, and if blind tasted tested, many might not even realize this was a beer. Highly recommended! Favorite Cider Paired Dinner: It is rare to find restaurants offering multi-course dinners paired with hard ciders. This year, Post 390 hosted a superb Farm to Post With Kimball Fruit Farm, with several heritage production, single-harvest ciders. The food was delicious, from Roast Pigeon to Heritage Porchetta, and the cider pairings worked so well. In addition, the ciders were intriguing, tasty, and tended to be more dry. Everyone near me at the dinner really enjoyed the food and ciders, and overall, it was an excellent experience. We need more cider-paired dinners! Favorite Cider: From the Farm to Post With Kimball Fruit Farm, my favorite cider of the year was the Eden Specialty Ciders Ezekiel, a single varietal cider made from Kingston Black apples of the Windfall Orchard. This cider was also aged about about 12 months in an oak barrel. With an 8% ABV, this cider possessed an alluring aroma and on the palate it was a stunner. With a full body, it was elegant and crisp, complex and subtle, intriguing and delicious. It was dry, well-balanced and had a lengthy, satisfying finish, pairing very well with the porchetta. Frankly, it was one of the best ciders I've tasted in quite some time. Favorite Daiginjo Sake: The Born Tokusen Junmai Daiginjo is produced from the highest quality Yamada Nishiki rice, polished down to 38%. What helps to make this Sake more unique is that it was aged for at least two years at 32 degrees Fahrenheit, the freezing point of water. The aroma of this Sake is alluring and seductive, with rich fruit smells, floral accents and hints of spice. And on the palate, the complexity of its taste thoroughly impresses. There is a rich mouthfeel, an intense depth of flavor including tastes of citrus, melon, grapefruit, pear, vanilla, and licorice. It is silky smooth and elegant, with a lengthy, pleasing finish. Every sip brings something new to my mouth and made me crave the next sip. Simply superb. Favorite Restaurant For Sake: I've previously mentioned that Momi Nonmi is my Favorite Japanese Restaurant of the year, and part of the reasons for that is due to their Sake program. 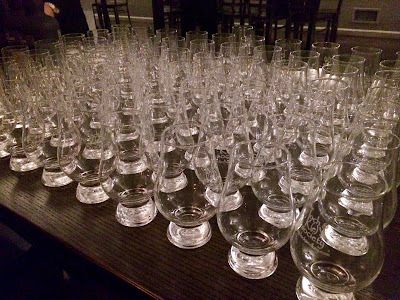 Their Sake sommelier, Stephen Connolly, has curated an intriguing and delicious list of Sake, and his knowledge and passion are quite evident as he helps diners with Sake pairings. It is a restaurant where Sake plays a dominant role, and isn't just an after thought. Go here for delicious food and Sake, and gain a bit of a Sake education. 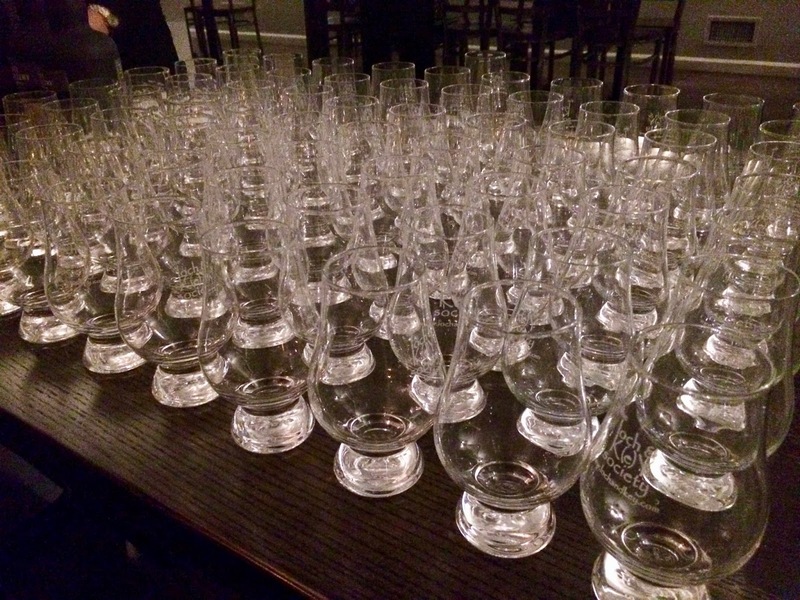 What were some of your favorite spirits, cocktails, Sake, and drink-related items this year? 1) Toast New Year’s Eve this year at Bistro du Midi with two menu options showcasing the best of Executive Chef Robert Sisca and his team’s luxurious cuisine. The first seating will be between 5:00 p.m. and 6:00 p.m. and feature a five-course prix fixe menu for $95 per person with the option of a wine pairing for an additional $65. The second seating from 8:00 p.m. until 10:00 p.m. will offer a special six-course prix fixe menu for $135 per person with a wine pairing option for an additional $75. Each seating will also have the option to supplement a decadent White Truffle Pasta course for $30 for the first seating, and $15 for the second seating. The full New Year’s Eve menu options include a selection of dishes, such as: Island Creek Oyster, black truffle & celery root panna cotta, truffle pearls paired with NV Ayala, Brut Majeur, Champagne; Venison Tartare, chestnuts, pine cone syrup, quail egg paired with 2016 Paul Nicolle, Chablis, Burgundy; Seared Foie Gras, pear, pomegranate, duck cracklings paired with 2017 La Spinetta, Bricco Quaglia, Moscato d’Asti, Piedmont; Brandt Beef Filet, sunchoke puree, mustard greens, smokey blue “béarnaise” paired with 2015 Chateau Deyrem Valentin, Cabernet Blend, Margaux, Bordeaux; and a Lemon Tart, champagne sabayon, blackberry ice cream paired with 2015 Chateau Bel Air, Vieilles Vignes, St Croix du Mont, Bordeaux. Reservations are strongly recommended so please call 617-426-7878. 2) Executive Chef Peter Agostinelli and the team at Grill 23 & Bar invite guests to splurge and make the final meal of 2018 the best yet. Dinner will be offered from 5:00 p.m. – 11:00 p.m. from the extensive Grill 23 & Bar a la carte menu, as well as additional specials. Start your meal with fresh seafood from the Raw Bar like Alaskan King Crab or Local Oysters. Order appetizers for yourself and the table including Kale & Brussels Sprout Salad (blue cheese, walnuts, beets, balsamic walnut vinaigrette) or Fried Calamari (fennel, onion, sweet chili crema). Enjoy entrees such as Cider Brined Kurobuta Pork Chop (brown butter sweet potato puree, walnuts, brussels sprouts, peppercorn gastrique) and Grilled Loch Duart Salmon (fingerling potato, kale, pistachio pumpkin seed pesto). Indulge in one of the chef’s a la carte “best of the best” such as American Kobe Cap Steak (10 oz). The night doesn’t end with dinner, enjoy music in the beautifully decorated restaurant starting at 9:00 p.m.
3) Start 2019 with a prosperous meal carefully crafted by Executive Chef Tyler Kinnett and allow the team at Harvest to take care of the rest. For $85, guests are invited to enjoy a four-course prix fixe menu featuring seasonal and local choices such as Baked Lady Apple (pie crust, foie gras, fennel & red watercress) and Red Wine Risotto (mushrooms, radicchio, pine nut & parmesan). Allow Pastry Chef Joshua Livsey to complete your celebratory meal with some of his favorite holiday treats like Mont Blanc (chestnut cake, crème Chantilly, earl gray ganache & mascarpone ice cream). Toast to the new year with an optional wine pairing. Other examples from the four-course prix fixe menu is as follows: Cranberries & Chicory, radishes, carrots, parsnips & blue cheese paired with Grüner Veltliner, Landhaus Mayer, Austria 2017; Linguini Carbonara, pancetta, egg yolk, parmesan & black truffle paired with Sangiovese, Badia a Coltibuono, Chianti Classico, Italy 2015; Painted Hills Beef Wellington, charred onion, carrot purée & béarnaise paired with Cabernet Sauvignon, Rock & Vine, Three Ranches, California 2016; and a Milk Chocolate Mousse, molasses cookie crunch, pomegranate gel & white chocolate fizz paired with Tawny Port, Ferreira, Duque De Braganca 20 year. 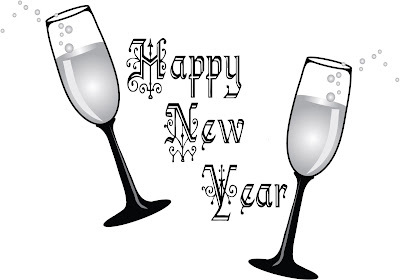 Reservations are recommended so please call 617-868-2255. 4) Join the team of Post 390 and Executive Chef Nick Deutmeyer for two exclusive prix fixe menus to ring in the new year. The first seating (5:00 p.m. – 6:30 p.m.) will feature a three-course menu for $75 per person and the second seating (7:00 p.m. – 11:00 p.m.) will boast a four-course menu for $95 per person. Selections from the menu include: Foie Gras Gougeres; hackleback caviar deviled eggs; French Onion Soup; Pan-fried brown butter gnocchi; Nantucket sea scallops; Bone-in Berkshire Pork Chops. After completing your meal, enjoy a complimentary glass of sparkling at the bar to celebrate the end of 2018. In addition to my list of Favorite Restaurant that I posted earlier today, I've also compiled my annual list of Top 50 Restaurants, those Massachusetts places where I'm sure to always have a delicious meal, whether a casual breakfast or a high-end French dinner. These are the places I seem to recommend the most to others, including some places where I dine on a regular basis. Many of these places have been listed on prior Favorite Lists, some for multiple years, and are all worthy of recognition and recommendation. There are also some new Favorites, places I only recently encountered but which I know I will be returning frequently. Please note that this is not a list of the "Best" Boston-area restaurants, but my own personal favorites, however I suspect most people will agree that the restaurants on this list are all worthy of your attention. Please also note that there are thousands of restaurants in the Boston+ area and just because a place is not on my list doesn't mean I wouldn't recommend it. This is only a small list, and can't include every good restaurant. Plus, there are some worthy restaurants that I haven't yet dined at, or reviewed, and I hope to remedy that in 2019. This is certainly not a complete list but it is more a sampling of memorable restaurants and food items I've experienced and/or posted about over the past year. This is also a purely subjective list, based on my own preferences, and makes no claims about being the "best" of anything. But all of the items here have earned my strong recommendations and I hope you will enjoy them as well. For more Restaurant reviews, you can just search my blog posts for the past year. Favorite Hot New Restaurants: This category includes several restaurants that have opened in the last few months, which have already impressed me, but which I haven't yet written a review. In early 2019, I'll likely review these worthy restaurants (after additional visits). Tonno in Wakefield: This is the second location of Chef Anthony Caturano's Italian Seafood restaurant. I eagerly anticipated its opening and it easily lives up to my high expectations. 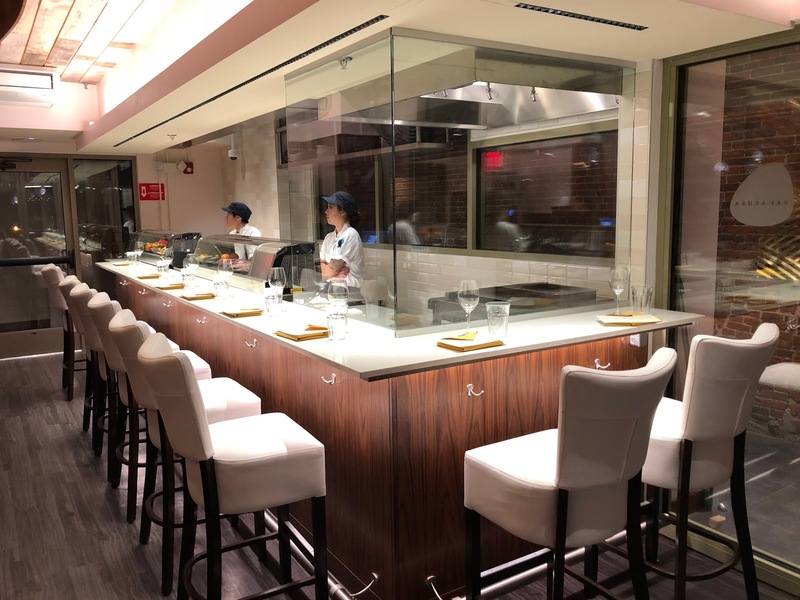 Kamakura in Boston: Chef Youji Iwakura has brought Japanese Kaiseki cuisine to Boston and the restaurant is aesthetically cool and the food is killer. Feng Shui in Burlington: The sixth location of this Chinese restaurant opened near the Burlington Mall and their lunch buffet is compelling, and their cocktails are quite good. Home Taste in Arlington: A second location of this Chinese restaurant, they specialize in delicious hand-pulled noodles. hand-made dumplings, Chinese casseroles and more. Aaron's Taco Cart'el in Stoneham: A small, casual and tasty spot for tacos, burritos and nachos, where customization rules. Favorite New Haitian/Dominican Restaurant: From delightfully flaky Paté to Jerk Beef Sliders, from savory Griot to a Cream Corn Souffle, Infused Kreyol in Malden is making delicious and compelling food. It's a tiny spot that once was home to a bakery but it's well worth seeking out. This isn't a cuisine you often see in the Malden+ area and thus there was a need for such a restaurant. Prices are very reasonable, service is usually very good, and the freshness of their dishes is impressive. And their Paté was one of my Top Ten Restaurant Dishes of 2018. Favorite Suburban Italian Restaurant: Il Casale, with locations in Belmont and Lexington, is killing it, especially with their wine dinners. Such professional service, exquisite food, and interesting drinks, from wine to cocktails. Their popularity, judged by how they can sell out an entire restaurant for a wine dinner when most other places are lucky to fill a table or two, is indicative of how well they are received in their community. And their Ragu Bianco was one of my Top Ten Restaurant Dishes of 2018. 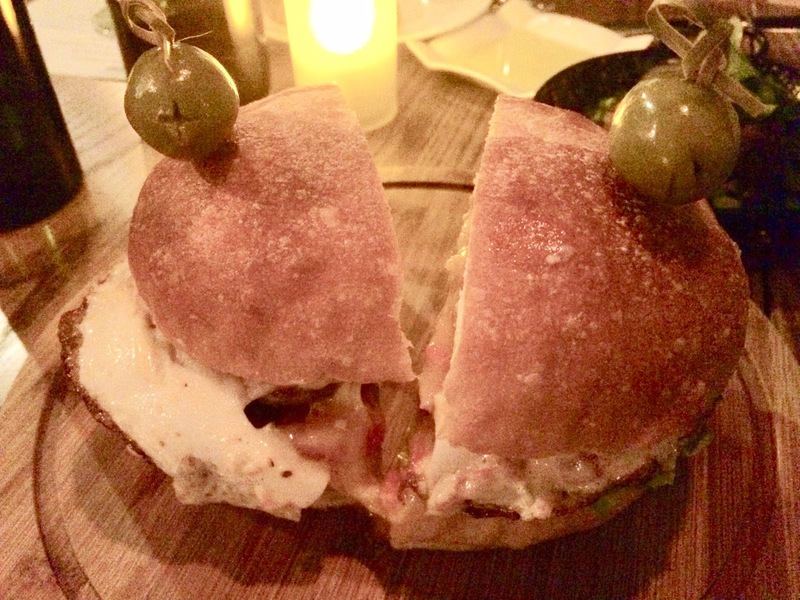 Favorite South American Restaurant: In Watertown, the former owners the famed Cambridge restaurant Salts, have started a new restaurant, La Bodega By Salts, which reflects owner Analia Verolo's homeland of Uruguay. Much of the menu consists of small plates, a great way to experience a number of dishes, which either have Uruguayan or Spanish roots. The food is fantastic, the wine list has plenty of Uruguayan wines, and their cocktails are stellar. Service is excellent and the restaurant itself is cool, especially where they have reused an old railroad car. And their Chivito was one of my Top Ten Restaurant Dishes of 2018. 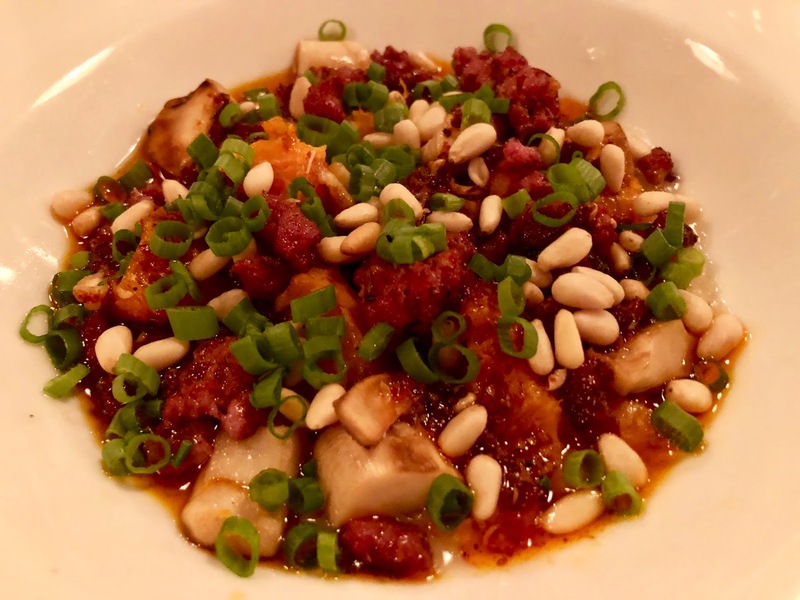 Favorite Japanese Restaurant: Chef Chris Chung is rocking it in Inman Square in Cambridge at Momi Nonmi, a casual Japanese izakaya with some Hawaiian influence. The food is amazing, with ingredients that are fresh and high quality, including rarities not commonly found in the area. The cuisine is also inventive and innovative, with plenty of special dinner events. Chef Chung's culinary skills are top notch. They also have an impressive Sake, Shochu and cocktail program. Again, this is another small restaurant but one you should not miss. 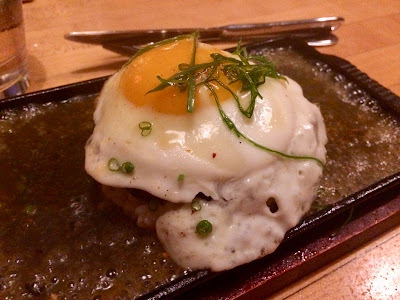 And their Teppanyaki Loco Moco was one of my Top Ten Restaurant Dishes of 2018. Favorite Tasting Menu: Around since 2016, The Table at Season To Taste, located in North Cambridge, offers a four-course tasting menu each evening which changes every 4-6 weeks. You have two options for each course and the food is delicious and inventive, supported by an excellent wine program. It is a small and cozy restaurant, with an open kitchen, and you receive very professional service. And their Brown Rice & Sweet Potato Congee was one of my Top Ten Restaurant Dishes of 2018. 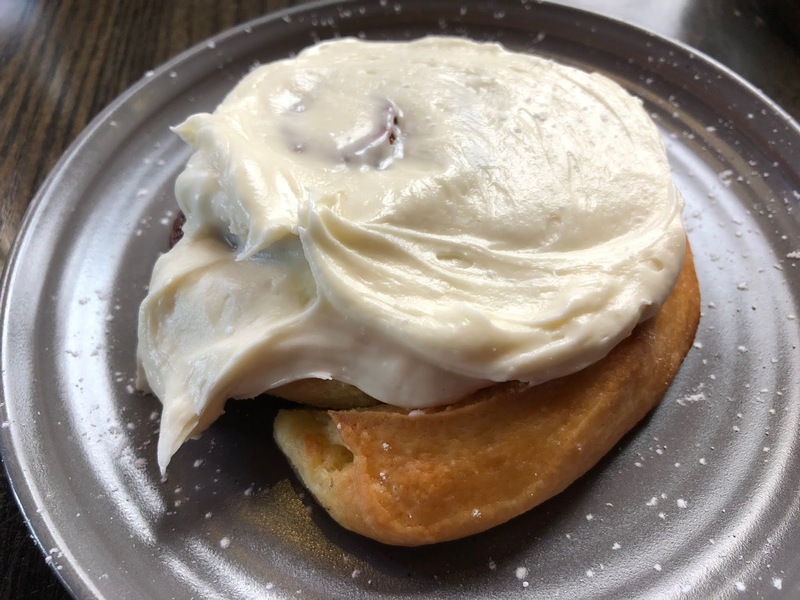 Favorite Brunch: At Ledger Restaurant & Bar, in Salem, they have an excellent Brunch Menu, from a 22-ounce Bloody Mary to their home-made Donuts, from Eggs Benedict to Banana Bread. Excellent service, a patio during the summer, and a menu of enticing dishes. Have a breakfast dish or a more lunch dish, such as a Fried Chicken Thigh Sandwich or a Breakfast Burger. And their Chicken & Waffles was one of my Top Ten Restaurant Dishes of 2018. Favorite Fusion Cuisine: Though it was only available for several days around Cinco de Mayo, the "Grexico" menu, a combination of Mexican and Greek cuisine, at Committee was fusion cuisine at its best. The various dishes seamlessly blended ingredients from both cuisines, creating delicious and inventive dishes that thoroughly impressed me. Grecomole, Guajillo Hummus, Churros with Merenda, and much more. I hope they will hold this event again in 2019, and I could easily see this fusion cuisine centering a new restaurant. And their Lamb Barbacoa Tacos was one of my Top Ten Restaurant Dishes of 2018. Favorite Chef's Return: Famed Chef Marisa Iocco returned to Spiga in Needham, transforming their Italian menu but maintaining some of his well-known specialties. You'll find dishes like Guazzetti, a unique Italian stew and Spiga might be the only local restaurant serving this item. Their Pizza is excellent and their Pasta dishes are killer. A cozy spot, it is open for lunch and dinner, and is worth the journey to Needham. And their Timballo was one of my Top Ten Restaurant Dishes of 2018. Favorite Restaurant Dessert: After enjoying the savory options from Chef Marisa Iocco at Spiga, you can peruse their Dessert menu but I think your best option is her famed Bread Pudding, which I first enjoyed several years ago. I've even recommended people start their meal with the Bread Pudding so you ensure you aren't too full after dinner to enjoy it. Every spoonful is absolutely delicious, a hedonistic treat which I cannot recommend enough. Great texture to the bread, a nice blend of sweet and salty in the sauce, and nice hints of vanilla. We really need a bakery that specializes in Bread Pudding. Favorite Hidden Restaurant City: Malden has plenty of interesting restaurants, especially Asian ones, but you wouldn't suspect that some fascinating dishes are "hidden" within rather ordinary appearing spots. From its storefront, you'd think Classic Pizza is your typical pizza and sub shop however they also have a small, but delicious menu of Indian dishes, including a killer Chicken Tikka Masala. Jay's Pizza also appears to be a normal pizza and sub joint, but they also sell Nepalese Momos, dumplings. 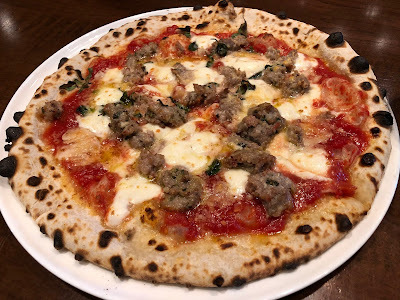 In 2019, I'll be checking out other pizza joints in Malden to see if any others are hiding more unique and tasty dishes. Favorite Food Book: Written by Gabriella Opaz & Sonia Andersson Nolasco, with photography by Ryan Opaz, the compelling Porto: Stories From Portugal's Historic The Bolhão Market succeeds on many levels. It discusses the history of Portuguese cuisine while also telling intimate stories of the various vendors at the Bolhão Market. This is not some dry travelogue but rather a seductive lure intended to convert you into a culinary lover of northern Portugal. It will work well as a reference guide as well, something to turn to from time to time to better understand Portuguese cuisine. Highly recommended. Favorite Culinary School: NECAT is a local culinary school which trains people from challenging backgrounds, from ex-convicts to recovering addicts, from the homeless to the chronically unemployed. NECAT fills an important need for culinary help while helping numerous people achieve a better life. It is such a worthy school, helping to transform lives, and it really touches my heart. It helps individuals while also helping the community, having recently celebrated its 5th Anniversary. I continue to try to raise awareness of NECAT so that its good work can continue and even expand. Favorite Food Trade Event: Once again, I have selected the Seafood Expo North America (SENA) as my favorite. It is a massive trade event, a three day event showcasing purveyors of seafood and related vendors. You'll find tons of free seafood samples and learn plenty, from sustainability to cooking. The Seafood Show is an engaging event and you can read my latest articles here: Part 1, Part 2, Part 3. The Seafood Show is compelling on many levels and I look forward to attending the next SENA in March 2019. Hope to see you there too. Favorite Food History Article: This year, I'm especially proud of my article, "Water Doughnuts": Some Bagel History. I found numerous fascinating newspaper articles, dating back as far as 1930, about bagels. There were Recipes for making bagels at home, information about various flavored bagels, canned bagels, pizza bagels and more. More writers need to use old newspaper archives in their research as you never know what intriguing information you will find. Let me continue the lists of my best recommendations and favorites of 2018. I have already posted three Top Wine lists and my Favorite Wine-Related Items. Now I want to move onto food and showcase my Top Ten Restaurant Dishes of the past year. This list includes ten dishes which I not only enjoyed immensely, but which I also found to be particularly compelling for various reasons. They might be especially delicious or something more unique, but all stand out for some particular reason, above the other dishes I have tasted this past year. These are the type of dishes I would order again and again, and which I would highly recommend. And I'll note that all of these restaurants are located in Massachusetts. This is certainly not a complete list but it's more a sampling of memorable dishes I have experienced and/or posted about over the past year. It is also a purely subjective list, based on my own preferences, and makes no claims about being the "best" of anything. But all of the items here have earned my strong recommendations and I hope you will enjoy them as well. This list is not in any order of preference, so all receive equal accolades. For more of my favorite restaurant dishes, you can just search my blog posts for the past year. 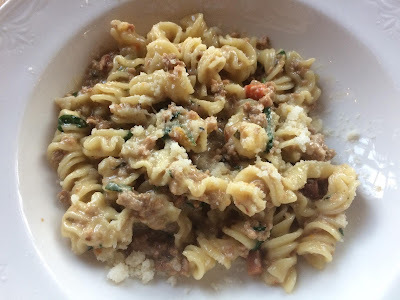 At a San Felice wine dinner, I was thoroughly impressed with their Fusilli fatti in casa con ragù "bianco" di carne e salamino di cinghiale (Handmade fusilli with "white" meat ragù and diced wild boar salami). This "ragu bianco" is traditional mostly in northern Italy, including Tuscany, and it is made with cream rather than tomatoes. This was simply a perfect dish, with homemade pasta cooked just right, plenty of savory and tender meat, a touch of earthiness, and a cream sauce that added plenty of flavor. The sauce was neither cloying or overly heavy, and I could easily have devoured a couple more plates. It is rare to see a ragu bianco at local restaurants, and that really needs to change if this dish is an example of what can be created. The Chef even provided me a copy of the Recipe, and we've made it at home successfully. 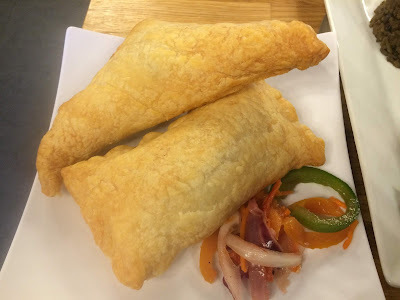 Infused Kreyol serves Haitian and Dominican dishes and one of their Small Bites is the Paté, a flaky pastry filled with shredded chicken, ground beef, cod fish or veggie. I've tasted three of the four, excluding the veggie, and loved them! They are made fresh each day, and the pastry is light, flaky and buttery, exactly what you want it to be. The ample fillings have intense and tasty flavors, spiced well. And at only $2.50 each, they are a great value too. The Paté are kept near the register to it is easy to stop by and pick up a few to enjoy at home. 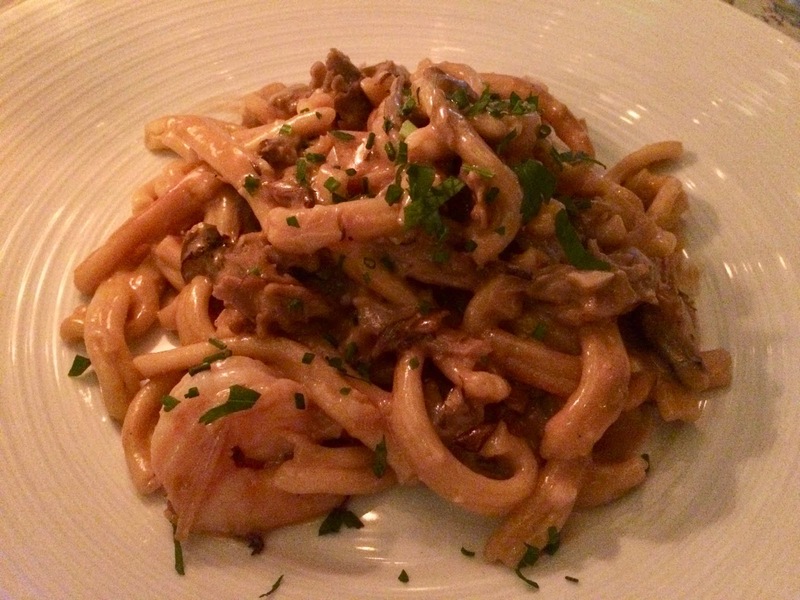 This compelling dish is made with Casarecce pasta, roasted mushrooms, and Marsala cream. As I love a good Marsala sauce, I knew I had to try this dish and it was absolutely delicious, a rich dish which was well balanced, the key to the dish's success. The creamy Marsala sauce wasn't overly sweet and the pasta, cooked perfectly, and was an excellent vessel for the sauce. The plump shrimp, coated with the creamy Marsala, were exquisite and the roasted mushrooms added some earthiness and umami to the dish. It was comfort food, a hearty portion of Sicilian-inspired seafood. To honor Cinco de Mayo, Committee created a special "Grexico" menu, fusing Greek and Mexican cuisines. My favorite dish of the evening were the Lamb Barbacoa Tacos, made with braised lamb, tzatziki, and Fix beer (a Greek beer) guajillo, atop grape leaf-corn tortillas. Grape leaves were crumbled into the mixture of the corn tortillas, providing its different color and texture. They were unique and delicious, such a delightful fusion of cuisines. Who would have thought such a combination could be so tasty? The lamb was moist and tender, just exquisitely prepared, and the entirety of the taco worked so well. I could easily see a Greek-Mexican Taco joint doing very well in the Boston area. 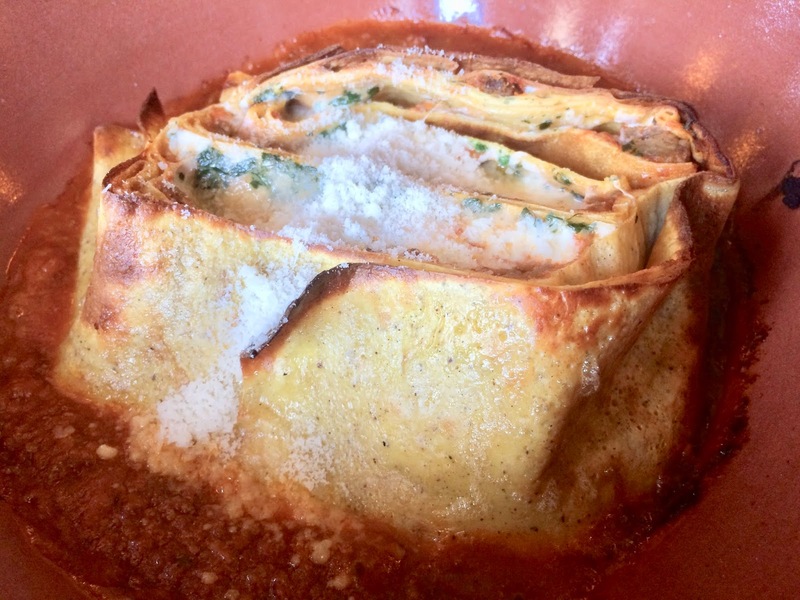 This hearty dish is made with crespelle (kind of an Italian crepe), meat ragú, and locally sourced dried mozzarella. What an amazing dish, such excellent comfort food! It reminded me in some respects to a lasagna, though the crespelle is softer. The ragú contained plenty of flavorful meat in a superb red sauce, and there was lots and lots of gooey cheese. It is an amply portioned dish so bring your appetite. So much flavor in a superb dish, perfect for a chilly winter evening. Chivito, which literally means "small goat," is a popular sandwich in Uruguay, and generally is a steak sandwich with a variety of toppings. The Chivito al Pan is sliced beef tenderloin, country ham, bacon, and a fried egg. It is quite a large sandwich, and a bit messy to eat, but it was also quite tasty, with plenty of tender meats. The soft roll enhanced the sandwich, which is large enough to make its own meal. An excellent comfort food and I understand its popularity in Uruguay. Speaking of comfort food, the Teppanyaki Loco Moco hits the spot. It is composed of a bed of rice, topped by a grilled grass-fed beef patty and a fried egg. Tableside, a sizzling gravy is then added to the dish. Wow, this would be the perfect hangover food! The rich and savory gravy was a superb addition to this dish, enhancing the flavor of the beef and egg. The yolk also added its own richness to the dish, and eating the gravy soaked rice was pure pleasure. I certainly didn't need or want a bun for this burger. You probably wouldn't expect to find a burger here, but you need to check it out as I bet you'll place it on your list as one of the best burger dishes in the Boston+ area. 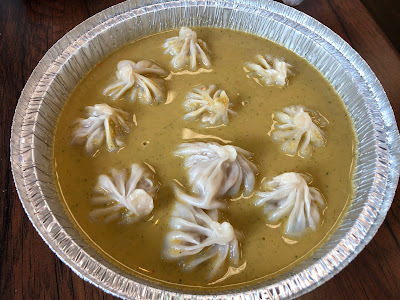 Who would have suspected that your typical pizza, subs, and ice cream shop would also carry Nepalese Momos? Their Jhol Momo dish consists of 10 hot Momos in a cold broth. The dichotomy between the hot and cold was initially a little jarring, as it isn't a usual combination you find in many cuisines. However, after the initial trepidation, I found that the combination actually worked well. The momos themselves possessed a fairly thin dumpling wrapper that had just the right amount of consistency, and they were filled with an ample portion of a tasty pork and spice mixture. On their own, the momos make an excellent dumpling. Now, the cold broth was intriguing, with a strong and complex curry taste, and it added to the flavor of the momos. The broth seemed to have lowered the temperature of the momos, transforming the hot dumplings into a dish that worked well on a hot summer day. The Brunch menu at Ledger is compelling, from their Cinnamon Rolls (pictured at the very top of this article) to their Home-made Donuts. 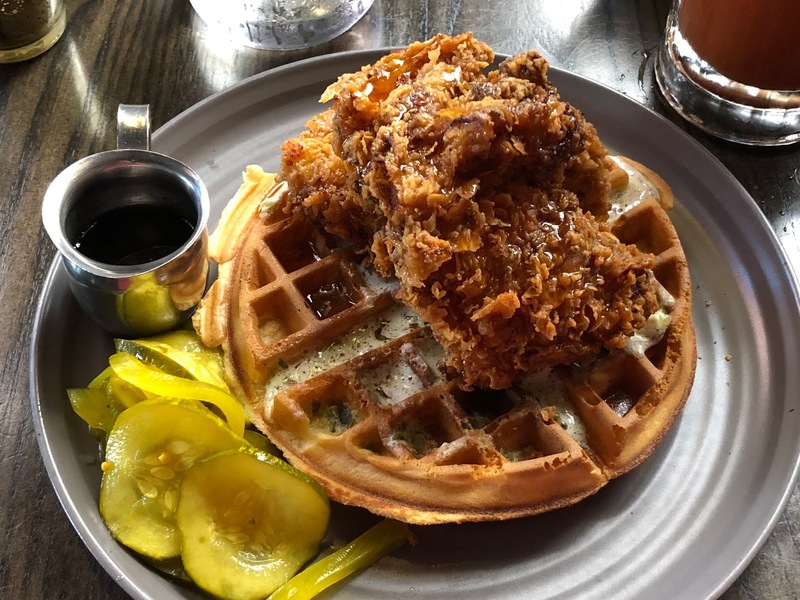 Their Chicken & Waffles entree includes buttermilk fried chicken, a corn waffle, green chile butter, hot honey, and a side of pickles. The fried chicken was superb, with a great, crisp and clean coating, moist chicken with an added sweetness from the honey. The waffle too was very good, with only a mild corn flavor, enhanced by a subtle spice from the green chile butter. One of the best Chicken & Waffles dishes I've enjoyed in some time, and it is highly recommended. The Brown Rice & Sweet Potato Congee was made with wild boar sausage, Matsutake mushrooms, pine nuts, and Szechuan chili. Congee is basically an Asian-type of rice porridge, and there are many variations in the various Asian countries. This dish impressed me with its depth of flavor, varied textures, and it was perfect for a chilly fall evening. There was plenty of moist, tender wild boar, chunks of sweet potatoes, and crunchy pine nuts, There was a mild spiciness to the dish which built over time, and it was also an ample-sized dish. Pure comfort food and highly recommended. The leading cause of death in the U.S. is heart disease, killing over 614,000 people each year. You can be proactive and significantly reduce your chances of heart disease by one simple lifestyle choice, eating more seafood. Over 20,000 research studies have been conducted on the health benefits of seafood and they have concluded that eating seafood twice a week can reduce your chance of dying from heart disease by about 36%. You won't find another single food that has been scientifically proven to reduce heart disease so much. Besides helping to reduce heart disease, research has also been providing growing evidence of the health benefits to the brain and bones as well as against cancers and inflammatory diseases. So why aren't you eating seafood twice a week? Last week, there was some good news, that Americans consumed more seafood in 2017 than the previous year, an increase of 1.1 pounds per capita to 16 pounds. However, that is still 10 pounds less than the recommended annual amount of 26 pounds, based on seating seafood twice a week. Americans still need to eat much more seafood. The increase in 2017 is a positive step, but it must continue. In the last 18 years, the highest annual seafood consumption was in 2005 with 16.6 pounds, dropping to a low of 14.4 pounds in 2012. A positive increase occurred in 2015 when annual consumption actually increased nearly a pound to 15.5 pounds but 2016 saw that figure fall, down to 14.9 pounds. 2017 echoed 2015, seeing a 1.1 pound increase to 16 pounds. For comparison, in 2018, it is predicted that Americans will eat an annual average of 222 pounds of red meat and poultry. Annual average seafood consumption is less than 7% of this amount, indicative of how little seafood Americans actually eat. There is so much room for the growth of seafood consumption, with only a relatively minimal decrease in meat and poultry consumption. With all of the health benefit of seafood, why can't you increase your consumption? In more good news, it seems that Americans are starting to be more diverse in the seafood species they consume. Despite the fact that there are between 300 and 500 different species of fish and shellfish available for sale, American consumption of different types has been very limited. In 2014, about 55% of the seafood consumed in the U.S. was limited to three types: shrimp, canned tuna and salmon. And 90% of what was consumed was limited to only 10 different types. In 2015, those ten species included: Shrimp (4 lbs), Salmon (2.9 lbs), Tuna (2.2 lbs), Tilapia (1.4 lbs), Alaska Pollock (1.0 lbs), Pangasius (.7 lbs), Cod (.6 lbs), Crab (.6 lbs), Catfish (.5 lbs), and Clams (.3 lbs). These Top Ten species constituted about 14.2 pounds of annual consumption, with another 1.3 pounds of miscellaneous species. Positive change was seen in 2017, as the Top Ten species decreased from 90% to 84%, down to 13.5 pounds with 2.5 pounds of other miscellaneous species. In 2017, the Top Ten species included: Shrimp (4.4 lbs), Salmon (2.41 lbs), Tuna (2.1 lbs), Tilapia (1.08 lbs), Alaska Pollock (.78 lbs), Pangasius (.71 lbs), Cod (.66 lbs), Crab (.52 lbs), Catfish (.53 lbs), and Clams (.31 lbs). By limiting ourselves to primarily ten species, we put heavy pressures on those seafood populations, causing sustainability issues. It is why many of those species have quotas, because their populations would be threatened by unregulated fishing. We need to ease those pressures by lowering consumption of those species, and consuming other species that don't have sustainability issues. We have to give the populations of those ten common species more time to rebound and recover. By limiting ourselves to primarily ten species, we are also hurting the economic situation of our fishermen, driving some of them out of business. With strict quotas on the most common seafood species, it gets harder and harder to make a living by catching those fish. Fishermen harvest many other different seafood species but there is little market for many of those species so they can't earn much money from those catches. If Americans started consuming more of those less common species, the market for them would grow, helping fishermen make more money. We should cherish our local fishermen and help protect them, especially when it is so easy to do so by simply consuming different types of seafood. Don't you want to help your local community? Get over your psychological barriers! Don't be afraid of something unfamiliar and take a chance on a different fish. It is time now to stop eating the same old fish all the time and experiment with less common seafood, to broaden your palate to the pleasure of whelks and sardines, cobia and mackerel. You will enjoy the tastes if you only give them a chance, especially if you dine at a good restaurant which knows how to properly prepare seafood. For the sake of sustainability, to save our oceans and all of the endangered species, to save our fishermen, this is an excellent choice and one you should seriously consider. Eat seafood at least twice a week. Eat more diverse seafood, and not just the usual suspects. Let me continue the lists of my best recommendations and favorites of 2018. I have already posted my Top Ten Wines Under $15, Top Ten Wines Over $15 (But Under $50) and Top Wines Over $50 lists. This post will now concentrate on some of my Favorite Wine-Related Items, which are not specific wine recommendations. This is certainly not a complete list but it is more a sampling of compelling and memorable matters I have experienced and posted about over the past year. Analysis Of Top Ten Wines: In my three prior Top Wine lists of 2018, I mentioned a total of 36 wines, which included wines from 9 different countries and regions, four less than last year. In first place was Portugal, with 10 wines, and I'll note that last year, Portugal and Georgia were tied for first place, each with 6 wines. France came in second with 6 wines, including 3 from Alsace. Spain and Italy tied for third place with 5 wines each. Uruguay and California each had 3 wines, while Germany had 2 wines. Rounding out the lists, Turkey and Australia each had 1 wine. As for wine types, the lists are also broken down into 4 Sparkling, 3 White, 4 Rosé, 18 Red, 6 Fortified and 1 Aromatized Wine. Favorite Discount Wine Stores: Consumers always want bargains, excellent value wines which won't stretch their wallets. You can buy the cheap, mass-produced commercial wines which can be found in almost any wine store or instead, you can seek out excellent, value wines which put to shame those cheap wines. Certain discount wine stores provide not only excellent prices but also an interesting selection and good service. I want to highlight three such stores which continue to do an especially good job, places where I go to seek bargains: Bin Ends in Braintree & Needham, Wine Connextion in North Andover, and Rapid Liquors in Stoneham. Shop at any of those stores and you won't be disappointed. Favorite Wine Stores: This is a small list of wine stores which consistently impress me with their selection and service. Each shop is worthy of your patronage and wine lovers should make the effort to visit these places if you have not done so yet. Favorite Private Wine Dinner: The wines of Uruguay are still new to many but they deserve your attention. I had the opportunity to taste several Uruguayan wines from the portfolio of Bodega Garzón: Uruguayan Treasures, From Albarino to Tannat, finding plenty of treasures, from Albarino to Tannat, Cabernet Franc to the high-end Balasto. Three of their wines ended up on my Top Wine lists this year. And we got to enjoy this wines while dining at the compelling La Bodega By Salts, savoring some Uruguayan cuisine. Such delicious food, paired with excellent wines, combined to elevate the evening. Runner-Up Favorite Private Wine Dinner: When you're savoring a dish of Escargot en Cocotte, snails in garlic butter, at Brasserie Jo, you probably crave some French wine. I had an enjoyable and fascinating lunch there with Romain Teyteau, the North America Export Director for Les Vins Georges Duboeuf, which led me to write about The Beauty Of Beaujolais. We had plenty of stimulating conversation, while tasting some delicious wines, including some killer Beaujolais. A couple of those wines even ended up on my Top Wine lists. Favorite Public Wine Dinner: This was an easy decision as Il Casale in Belmont thoroughly impressed me with their San Felice Wine Dinner. They sold out the entire restaurant, indicative of the popularity of their wine dinners, and I understood the reasons. The food was superb, the wines were amazing, and service was professional. They made it seem easy to serve around 100 guests the same multi-course dinner. A couple of the Italian wines from this dinner ended up on my Top Wine lists. Plus, I was stunned by one of their incredible dishes, the Fusilli fatti in casa con ragù "bianco" di carne e salamino di cinghiale (Handmade fusilli with "white" meat ragù and diced wild boar salami). It was one of the best dishes I ate in 2018. I also attended a wine dinner, dedicated to Olio Taibi & Olive Oil, at their Lexington location, which was just as well done. I give my strongest recommendation that you attend an Il Casale wine dinner. Favorite Regional Wine Tasting: With a fascinating and delicious portfolio of nine, family-owned Greek wineries, from all across Greece, An Odyssey Greek Wine Tasting with Cava Spiliadis was a stellar tasting event, one that was open to the public. I've long been an advocate for Greek wines and it is tasting like this that can be so persuasive to consumers. The wines were diverse, a myriad of styles and flavor profiles, as well as approachable and food-friendly. Every wine I tasted had its merits and I loved learning more about the indigenous grapes of Greece as well as its terroir. Plus, Post 390 presented plenty of tasty food to accompany all of the wines. You need to Drink More Greek Wine! Runner-Up Favorite Regional Wine Tasting: Puritan & Co. hosted an informative and fun tasting of Georgian wines, which I wrote about in two parts: Georgian Wine: All About Context (Part 1) and Georgian Wine: All About Context (Part 2). Georgian wines are another passion of mine and I take almost every possible opportunity to taste their wines. With 8,000 years of vinous history, over 500 indigenous grapes, and a tradition of the qvevri, Georgia has plenty to offer a wine lover. There was even an intriguing discussion about skin contact wines that raised some compelling issues. You need to Drink More Goergian Wine! Favorite Formal Wine Seminar: At the City Winery, I attended an educational seminar about the wines of the Italian region of Alto Adige - Südtirol, which were once known as Rhaetian Wines, Favorites of the Ancients. We did some comparison tastings of wines from various grapes, including Pinot Bianco, Schiava, Pinot Grigio, Pinot Nero, Lagrein and Gewurtztraminer. I was particularly taken with the Schiava wines and want to find more of them to sample. Overall, the wines were delicious, food friendly and compelling, sure to please any wine lover. Favorite Informal Wine Seminar: This year, Sommelier Theresa Paopao created a Wine School At Asta, an afternoon wine lounge inspired by New York Times wine critic Eric Asimov’s monthly column. I visited the restaurant during the month she showcases the Fiano grape, offering seven Fiano wines from the Campania region of Italy. They were all available by the glass as well as in flights of three wines. Theresa explained all about the grape and the various wines, evidencing her passion and knowledge. Plus, you could pair the wines with various special and delicious dishes created by the restaurant. Excellent food and drink in a fun and informative atmosphere make this a compelling event and hopefully they will continue their Wine School in 2019. Favorite Restaurant Wine List Change: At Committee, one of my favorite Greek restaurants, Wine Director Lauren Friel instituted significant changes to their wine list, compiling an All Greek, All Natural Wine Program. The list is diverse, exciting, reasonably priced and has plenty of delicious options. And this past summer, they held a Natural Wine Pop-Up on their patio on Wednesday nights, helping to promote their new list. The wines pair very well with the various Greek dishes and every wine lover will find something to excite their palate. Lauren has done a great job with this new list and I will repeat, You need to Drink More Greek Wine! Favorite New Wine List: Though The Table at Season To Taste has been open since 2016, I only just dined there recently. And I look forward to dining there again very soon. Besides their excellent food, they have an intriguing wine list, curated by Jesse Eslin, their Wine Director, which changes on regular basis with their changing food menu. The wine list has plenty of intriguing and small production wines, the type of wines that excite an adventurous wine lover. The evening began well with a German sparkling wine made from the rare Elbling grape, and continued on that same level throughout the dinner. If you love wine, you need to make a trip to The Table at Season To Taste. Favorite Wine Pairing: Last New Year's Day, I chose to celebrate with a large pot of Lobsters, paired with two different bottles of Crémant d'Alsace. Sparkling wine is a versatile food wine and often pairs very well with seafood. With the sweetness and rich of lobster, especially dipped in drawn butter, it helps to have a wine with good acidity and these Crémant wines possessed that trait. Plus, their tiny bubbles helped to cleanse the palate between bites. 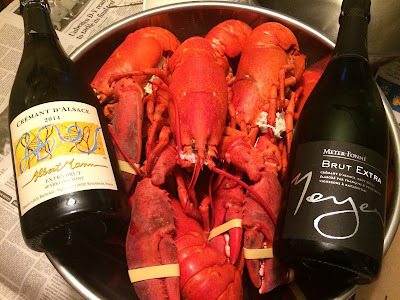 The complex flavors of the two Crémant wines also complemented the delicious lobster. It was a killer pairing, well appreciated by everyone at the table. And such a hedonistic way to begin the New Year. Favorite Wine Travel Event: This past October, I visited Portugal, touring Porto and the Douro region. It was an amazing trip, filled with so much fun and excitement, great food and wine, intriguing museums and historical sites, and much more. A number of the wines from this trip ended up on my Top Wine lists this year. And I'll be mentioning some of the culinary highlights in other Favorite lists next week. Check out my page of Collected Links, which will lead you to all of my 20 articles about the trip to Portugal. And I'll likely add a couple more articles next month. What were some of your favorite wine-related items this year? 3) Puritan & Co. invites guests to join them this Christmas Eve for a three-course holiday menu. With reservations available from 5 to 8 p.m., the menu costs $50 per person with an optional wine pairing available for an additional cost. 4) On Tuesday, December 18th from 6-9pm, join City Bar in the Westin Waterfront Hotel for a night out in support of Strong Women, Strong Girls Boston – a mentoring organization for girls in grades 3-5 with the goal of helping them develop skills for lifelong success. Tickets include champagne and spiked hot cocoa sampling, an Insta-worthy selfie station, and an appearance from a very special Mrs. Claus! There will also be some fun raffle items, including tickets to Laugh Boston and dinner at MJ O’Connor’s, custom fur ISlides, Red Sox tickets, and more. Strong Women, Strong Girls works to empower girls to imagine a broader future through a curriculum grounded on female role models delivered by college women mentors, who are themselves mentored by professional women. Strong Women, Strong Girls strives to support positive mentoring relationships between college women and pre-adolescent girls in underserved local communities with the vision that every girl realize her inner strengths to dream and do. Tickets are available for $35 via Eventbrite and will benefit Strong Women, Strong Girls. 5) Throughout the week leading up to Christmas, Chef Pino Maffeo of North End seafood restaurant il Molo will bring back his Feast of the Seven Fishes a la carte menu. The waterfront restaurant owned by Donato Frattaroli is known for serving up fresh, locally sourced seafood and ingredients in the city, and this traditional, Italian Christmas Eve dinner will be no exception. The seven dishes, which are priced between $16 and $38, are inspired by the own family traditions and Italian roots of the il Molo team. Guests can choose from a hand-crafted spaghetti dish in the form of Lobster Fra Diavlo, a Baccala “Two-Ways” plate uniting fried baccala and a baccala salad dressed with pickled vegetables, chili peppers, oil and lemon as well as a rare, stuffed “Seppie” (Italian for cuttlefish, or large calamari) stewed in a plum tomato sauce and Razor Clams served with cherry tomatoes. Other highlights include Clams Oreganata, Branzino, and Stuffed Lobster (MP). For dessert, Struffoli (pan-fried dough tossed with honey and sprinkles) will be offered to all guests as a complimentary treat from the kitchen. 6) The Feast of the Seven Fishes, known as La Festa dei Sette Pesci, is a deeply rooted Italian Christmas Eve tradition, originating in Southern Italy and honoring the vigil prior to a religious holiday when no meat was served. Join Davio’s Lynnfield on Monday, December 24, from 4pm-10pm, to celebrate the Feast of Seven Fishes with good food and great company. The three-course prix-fixe menu, prepared by Executive Chef Andres Tavares, will feature unique and delectable seafood courses in addition to the à la carte menu. COST: The prix-fixe menu is $75 per guest (excluding tax & gratuity). Reservations are recommended by calling 781.944.4810.